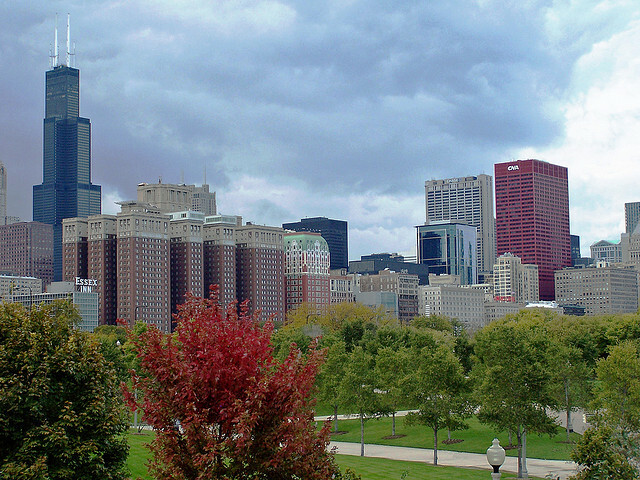 Grant Park in the fall. Summer may have its charms, but let&apos;s be real. When it comes to the three Ws (weather, wardrobe and whimsy), fall is the best season by far. The sopping humidity of summer suddenly turns crisp and purposeful, ushering in a new academic year and bursts of gorgeous, coppery color in the trees. Chicagoans also become more fashionable, as we trade in our often unflattering shorts and sandals for a more polished look of jeans, scarves, layered cardigans and boots. We indulge in pumpkin lattes, host more game nights, watch the leaves fall and celebrate three of the year&apos;s best holidays: Halloween, Thanksgiving and Buy Nothing Day. From Friday afternoon to Saturday evening, The A.V. Club (the arts-and-entertainment wing of The Onion) and The Hideout Inn (one of Chicago&apos;s best live music and performance venues) will combine forces for an epic music festival outside The Hideout at 1354 W. Wabansia. Performers include Young the Giant, Neko Case, Mavis Staples and Superchunk. Wine connoisseurs, rejoice! The 9th year of the Windy City Wine Fest, presented by U.S. Bank, will bring samples of over 345 different wines from all around the world, alongside food pairings from some of the city&apos;s best restaurants. Meet at Buckingham Fountain for demonstrations from local chefs and expert-led wine pairing seminars. Feeling crafty? This annual indie-craft marketplace, held on Division Street in Wicker Park, brings hundreds of craft makers out of their studios and into the spotlight for a festive weekend celebration of all things handmade. The Chicago English Bulldog Rescue (CEBR) will participate again this year too, making this fest 100 percent pet-friendly! Riot Fest may be described as the last hurrah of summer; but by the time Sept. 13 rolls around, the atmosphere will feel a lot like fall. Fortunately, cooler temperatures and a jaw-dropping lineup featuring The Replacements, Rancid, Pixies and The Violent Femmes makes for a stellar combination. This first-ever conference, presented by the Department of Cultural Affairs and Special Events (DCASE), will give Chicagoans the opportunity to learn more about our city&apos;s thriving music scene and connect with industry professionals at the local and national levels. More than 20 panels on a variety of topics will feature 100+ speakers, including representatives from Sony Music Entertainment, Pitchfork and Live Nation. New hotspots opening this season: Chop Shop and the 1st Ward (a Bucktown restaurant, bar, music venue and butcher shop combined into one) debuts in mid-September, A10 (a European venture from Matthias Merges of Yusho and Billy Sunday) arrives in October and Eataly (Mario Batali&apos;s megaspace of eight restaurants, a microbrewery and a culinary school) opens its doors in mid-November. 7. Drive out to the drive-in. Before the weather gets too cold, bundle up with some blankets, popcorn and good company at the old-timey Cascade Drive-In in West Chicago. The International Exposition of Contemporary and Modern Art — a celebrated arts and culture fest offering tours, artist discussions, special exhibitions and site-specific projects—will take place over a three-day weekend at Navy Pier, with a "Vernissage" opening night benefit on Thursday. The event will feature 125 galleries representing 17 countries and 36 cities, including London, Zurich, San Francisco, Berlin, New York City, Madrid and Chicago. 9. Volunteer at 826 Chi. Help tutor a Chicago student at 826 Chi, a non-profit organization dedicated to supporting learners ages 6 to 18 with their creative and expository writing skills. Back-to-school volunteers can choose to help students with their homework after-school, in schools, through events and outreach, on field trips or in conjunction with workshops at 826 and The Boring Store. 10. Hit up a Subject to Change event. Subject to Change, an LGBTQ-friendly collective that aims to create "no shame" when it comes to the music they enjoy and the people they care about, holds monthly events at Township to raise funds and awareness for a variety of different community organizations. Past events have included benefits for the Chicago Women&apos;s Health Center, Chicago Books to Women in Prison and Vida SIDA. Keep your calendar open every first Tuesday this fall for more! Chicago&apos;s annual street festival celebrating home design will feature a myriad of local vendors and antique collectors, as well as family hay rides, pumpkin painting to raise money for a local elementary school, square dancing, cold beer, delicious food and live music programming from The Hideout. 12. Hang out in a new bar. Coming soon: Dusek&apos;s/Punch House in Pilsen&apos;s historic Thalia Hall (mid-September), Analogue on Milwaukee Ave. (mid-October), and River North comfort food bar Tippling Hall (late October). Now in its 49th year, CIFF continues its tradition of bringing exciting new films from more than 55 different countries to Chicago&apos;s main stage. This fall, the lineup includes the much-buzzed documentary "Elaine Stritch: Shoot Me," the Israeli horror film "Big Bad Wolves" and the 2013 Cannes&apos; Palme d&apos;Or winner "Blue Is The Warmest Color. " The incredible Hubbard Street dancers have a hot ticket for Chicago audiences this year: a diverse and exciting program from choreographers Robyn Mineko Williams, Ohad Naharin, Mats Ek and Alejandro Cerrudo that will feature nods to Michael Jackson, the Paris Opera and "Flashdance." If you&apos;re not running that day, bring a sign and cheer on your friends! The marathon has Two Waves that start at 7:30 a.m. and 8:30 a.m., respectively, so bring that double-shot pumpkin spice latte with you to the start line. 16. See a new theater show. The must-sees: Joan Allen returns to the Steppenwolf stage for the first time since 1991 in the American premiere of The Wheel, The Goodman Theatre&apos;s fall season opens in September with Pullman Porter Blues, and the Tony-Award winning musical Once arrives at The Oriental for a limited run in October. Uptown&apos;s Vintage Garage, the only monthly flea market in Chicago, presents the best vintage and antique dealers under one roof every third Sunday from April to October. Don&apos;t miss your chance to attend the last two shows of the season: "Vintage Art" on Sept. 15 and "Record Ramp" with the Chicago Independent Radio Project (CHIRP) on Oct. 20. This annual hub of creativity, connection and inspiration kicks off Year 4 with a wide assortment of events, master classes, labs and special presentations. An impressive array of speakers includes Buzz Aldrin, Cat Cora, Dan Savage, Elizabeth Smart, Malcolm Gladwell and Terry McMillan. 19. Search for the best cider. &apos;Tis that time of year. For the hard cider fans: Sprout, SmallBar, The Grafton Pub and Kuma&apos;s Corner all have excellent selections. Since its formation in 2005, Third Coast Percussion ensemble has performed hundreds of concerts across the country. This year, TCP will be opening their Chicago concert season with a Frequency Series of "Infinitesimal Machinery" at Constellation on Oct. 20. 21. Go on a Zombie Safari Hayride. Make the trek to Tinley Park for an October weekend of fun, tractors and zombies in the cornfields! Yes, this is really a thing. Chicago Bears games are fun and all, but how about tossing the old pigskin in your own backyard? Organize a game of flag or touch football in your neighborhood park, then treat the winning team to beers. When scouring the streets for the best fall fashion, don&apos;t forget your local boutiques and online vendors. A few of my favorites: Wolfbait & B-girls, Sofia, Penelope&apos;s and Sara Tea Shop. 24. Laugh out loud at Pop Goes Alicia Live! Every first Tuesday at The Hideout until November, join host Alicia Swiz and a rotating panel of local writers, comedians and activists discussing the latest in pop culture and buzzworthy current events. 25. Step back in time to the 1893 Fair. Head to the Field Musuem on Oct. 26 for the Women&apos;s Board Gala in celebration of a sure-to-be stunning new exhibition: "Opening the Vaults: Wonders of 1893&apos;s World Fair." 26. Check out a new band. The gargantuan music fests of summer have come and gone (until we meet again, Walmart on the Lake), but never fear. Time Out Chicago has an excellent list of rising acts to fall in love with this fall: from Jenny Hyval at the Empty Bottle to Water Liars at Schubas to Lucius at Lincoln Hall. Mr. Interntional Rubber (MIR) is a rubber-fetish event that includes cocktail parties, a rubber/leather market and awards at the Center on Halsted. Go get your kink on, if you feel so inclined. 29. Find the best pie. During the autumnal months, a seasonal slice of delectable pumpkin or hot apple pie really hits the spot. Take refuge at Bang Bang Pie Shop, Hoosier Mama Company or First Slice Pie Cafe to satisfy your every craving. Watch Mayor Rahm Emanuel and the tree donor flip the switch at Chicago&apos;s 100th Annual Christmas Tree Lighting Ceremony, accompanied by live music and performances at Daley Plaza. And say, "Goodbye fall, I hardly knew ye."